*Cycling pants comes with 3D gel padding inside,3 foam densities 80kg/m3,breathable and comfortable,,PADDING is thickness,is suitble for long distance and abecedarian. This Item is on Year-End Deals NOW. More sale please click Brand "NOOYME"
Every enjoy your Sunday ride! NOOYME Sport with you together. With NOOYME bike underwear makes your trail rides or morning commute more comfortable and chafe-free. Constructed with soft elastic waist for comfort. Light microfiber fabric reduces bulk at inner thighs to avoid chafing. Compact Super stretchy chamois offers comfort for your recreational rides. Please refer to our Size Chart to find the best fit. When done washing, hang your cycling clothes to dry (The dryer can be dangerous for high-performance fabrics, especially for the reflective elements ). Wash your clothes in cool or lukewarm water instead of hot (Rinse your shorts again in cool water to ensure no soap or residue left behind). Click "Add To Cart" button above NOW to take advantage of our most affordable price and beat products! Join Year-End Deals. (Last-Minute of Deals) Breathable fabric wicks quickly and keeps you cool and dry. Can be worn under any shorts, tights or leggings for added riding comfort. Just try it, you will love it. 3D foam padding helps relieve the hip pain associated with long cycle rides for women. 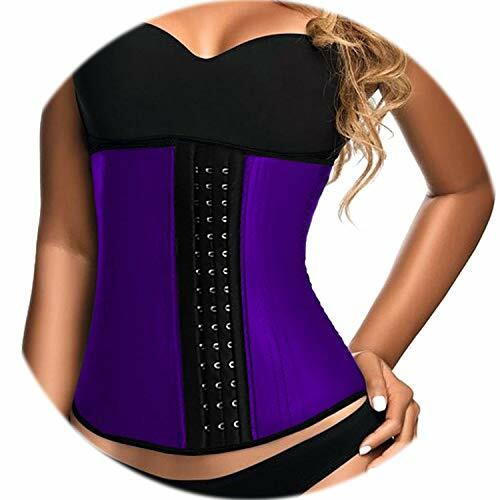 Standard Six Sizes: S=25-27 M=28-30 L=31-33 XL=34-36 XXL=37-39 XXXL=40-42(waist measurement), please according your normal size to choose the ideal size. More Choice. If you do not like cycling underwear, here also prepare NOOYME women cycling shorts for you. Click ?http://a.co/eV5iry7? to buy now. Why do you want to choose bike underwear? Beacuse women's 3D padded cycling underwear shorts is designed with stretchy, soft,quick-dry and breathable fabric, helps improve sweat transfer for comfortable wear during long rides ,flatseams and a tight fit reduce chafing whilst active, making these bike shorts an easy and comfortable pair to wear. Bike shorts outer layer:95%Polyester5%Spandex, women mtb shorts are incredibly breathable and will help keep you cool. The water repellent fabric also means that cycling shorts help you to stay dry when biking. Best for A to C cups .Delivers strategic support, tailored for medium-impact activities like cycling, weight training & boxing .Soft, breathable cups provide extra structure & coverage .Removable cups have helpful R & L arrows to easily put back in .Crossover straps with feminine keyhole detail .Updated elastic band feels super-smooth & soft .Super-smooth, double-layer HeatGear fabric delivers superior next-to-skin feel .Material wicks sweat & dries really fast & light .4-way stretch construction moves better in every direction . Best for A to C cups. Built for Low-Impact activity & all-day comfort. UA Seamless is a soft knit with engineered ventilation, mapped to the places you need it most. Soft, removable cups for enhanced shape & coverage. Skinny strap pullover with adjustable cross back design. Wide jacquard wordmark band for amazing stretch & comfort. Material wicks sweat & dries really fast. 4-way stretch construction moves better in every direction. Baleaf Women's 3D Padded Cycling Brief Underwear Shorts is designed with stretchy, soft and breathable fabric. Special waistband design can avoid the tummy squeezing and offer you great comfort in the saddle. Delivers strategic support, tailored for high-impact activities like running, court sports, field sports & aerobics. Clean, bandeau-inspired front with soft, breathable cups for extra structure & coverage. Full zip front for easy on/off. Unique open back with adjustable criss-cross straps. SpeedForm mesh lining. StudioLux fabric delivers relentless support with a super-soft luxurious feel. Material wicks sweat & dries really fast. Soft & super-breathable. If you're looking for the perfect pair of cycling shorts and are tired of cheap shorts that easily wear after little use, our Cycling Underwear are the perfect choice, with 3D padding, premium, breathable material and a lightweight design, The bicycle undershorts can be worn under any shorts, tights or leggings for added riding comfort. Just try it, you will love it. This is professinal degisned for cyclists with high quality and anatomical fit. With a 3D silicone pad, technically designed air permeability, more closed-fit but not be tight. The short edges are sealed flat so there are no harsh edges to rub against your skin. Very light, comfortable, it can help to reduce weight-bearing. 1.Size is not US standard,so please check the size chart of the Women bicycle shorts. 2.Suggest that by hand washing. And also this cycling underwear shorts can be used to machine wash with a laundry bag. PLEASE NOTE - The size is not US standard, please check the size chart in images or product description before ordering the women padded cycling underwear, All orders we accept at 30 days free returns. If the size doesn't fit? No worries, they are fulfilled by Amazon and therefore eligible for free returns,if you have any doubt on the size, please send us message, thank you. 3D PADDING - women's bike underwear designed with an ultra durable, premium, stitched 3D foam padding that won't slip or slide as with other bike shorts, for excellent resistance and comfort when used with hard, uncomfortable bicycle seats! The breathable pad features quality stitching that won't be subjected to wear-and-tear, and provides cushioning even while cycling for long distances, 3D Padding Shorts for Full Protection. MATERIAL CAN DISSIPATE HEAT - voofly womens biking underwear designed for cyclist specificly. Choose the double elasticity fabric(Polyester/Lycra Spandex and Silicone + high density sponge Padded), and updated the cut to compliment women's body shapes.Llight, soft and comfortable, and without pressure to your body, Easy to absorb and dry, makes you feel more active. COMFORTABLE FOR LONG DISTANCES - The padded bike underwear women use the soft fabric, polyesterand Lycra/Spandex which will not make the oppression of the stomach and thighs, resulting in uncomfortable. the women's bicycle underwear helps relieve the hip pain, wcking and breathable . It will better fit and protect the crotch and enjoy your cycling time during the journey. You feel more comfortable wearing them after each time. SERVES AS BEST GIFT - This biking underwear is highly durable. Unlike others this bike shorts does not irritate the skin, it is designed with skin-friendly materials. This is the best gift to give to those cyclist freak and they will very much value it. Wash with room temperature water, Do not brush or bleach, Please Cool iron.Put in wash pocket when wash in machine. Best for A to C cups. UA Compression sports bras deliver strategic support, tailored for medium-impact activities like cycling, weight training & boxing. Super-smooth, double-layer Classic pullover style with racer back design for enhanced range of motion. Super-soft jacquard elastic band delivers a custom, stay-put fit. HeatGear fabric delivers superior next-to-skin feel. Material wicks sweat & dries really fast. 4-way stretch construction moves better in every direction . Voofly Padded Bike Underwear Shorts, an ideal way to transform your favorite casual shorts into cycling shorts. The womens cycling underwear is specially designed for women by voofly design team, with a 3D silicone pad, technically designed air permeability, more closed-fit but not be tight like the second skin. The short edges are sealed flat so there are no harsh edges to rub against your skin. Very light, comfortable, it can help to reduce weight-bearing. Voolfy cycling padded underwear is professinal degisned for cyclists with high quality and anatomical fit.Now cycling is a kind of trend, more and more women began to join the ride. And this bicycle underpants can be worn under any shorts, tights or leggings for added riding comfort. Just try it, you will love it. Helps improve sweat transfer for comfortable wear during long rides. 1,Size is NOT US standard,please check the size chart below first. 2, Suggest that by hand washing. And also this cycling underwear shorts can be used to machine wash with a laundry bag. [PLEASE PAY ATTENTION TO THE SIZE] - Our size is NOT US standard, so please check the size chart in images or product description before ordering the cycling underwear shorts.All orders we accept at 30 days free returns,If the size doesn't fit? No worries, they are fulfilled by Amazon and therefore eligible for free returns,if you have any doubt on the size, please send us message, thank you. [BREATHABLE AND LIGHTWEIGHT] - voofly womens cycling shorts padded designed for cyclist specificly. Chose the double elasticity fabric(92% polyester + 8% spandex) which effectively absorb moisture and release sweat from the skin, keeps you dry and cool. At that they will stretch to fit your curves spectacularly, and move with your body in the cycling motion, almost like second skin. [3D PADDING FOR FULL PROTECTION] - designed with an ultra durable, premium, stitched 3D GEL foam padding that won't slip or slide as with other bike underwear shorts, for excellent resistance and comfort when used with hard, uncomfortable bicycle seats! The breathable pad features quality stitching that won't be subjected to wear-and-tear, and provides cushioning even while cycling for long distances, 3D GEL Padding Shorts for Full Protection. 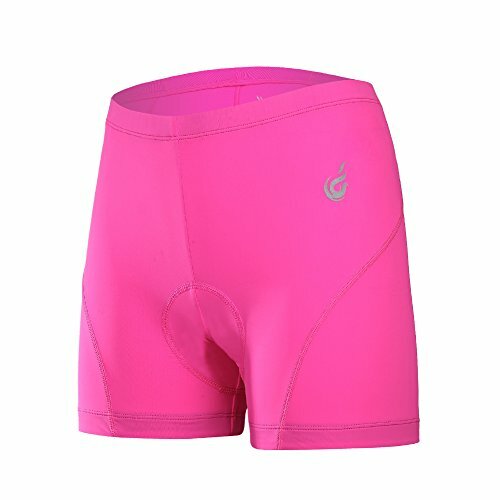 [DESIGNED SPECIALLY FOR WOMEN] - This womens bicyle underwear shorts padded are perfect for commuting and leisure rides, the 3D padding has cut-away areas, multi-dimensional and multi-thicknes density foam and shorter, shaped designs to help you support your sit bones and prevent you leaning too far forward onto more sensitive areas, causing discomfort,giving you the chance to comfortably ride in your favourite skirt, trousers or shorts. 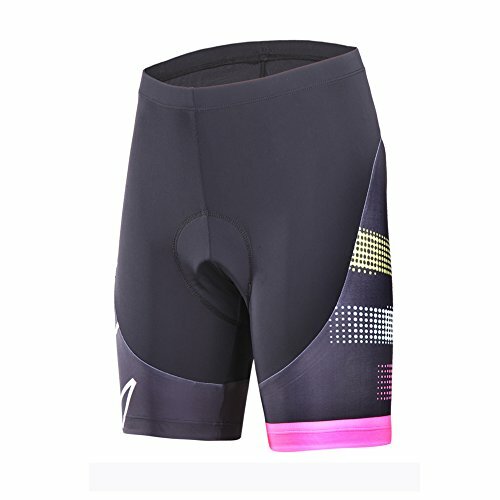 [COMFORTABLE FOR LONG DISTANCES] - The padded bike underwear women use the soft fabric, silicon pads, helps relieve the hip pain, wicking and breathable, which will not make the oppression of the stomach and thighs, resulting in uncomfortable, and protects your hipbone from injuries during long-distance cycling. It will help to enjoy your cycling time during the journey.
" Brand: coastal rose Item: coastal rose Women's Strappy Sports Bra Workout Yoga Sports Bras Style: sports bras Description: coastal rose strappy yoga bra is light supportive ,designed for low impact workouts, such as strength training, cardio, yoga ,running,jogging ,crossfit and some other workouts. Made of high quality moisture-wicking power fabric ,stretchy and breathable , easily takes moisture away from the skin, keep you cool and dry ,easily gives great comfort to your skin even after fitness.Crew neck design,provide with the modest coverage. Wide shoulder straps give more comfortable for the shoulder with fabulous support .Bult in with removable bra padded, warmly design with positioning line,keep in the right place with slightlymovable.Fabulous strappy back design,embellished perfectly the back figure,offers a charming back outline,the racerback straps effective enhanced range of motion.Soft band underneath prevent rolling up while workout ,and gives great support without suffocating.Comfortable fit contour perfectly to your body, without feeling constricting.